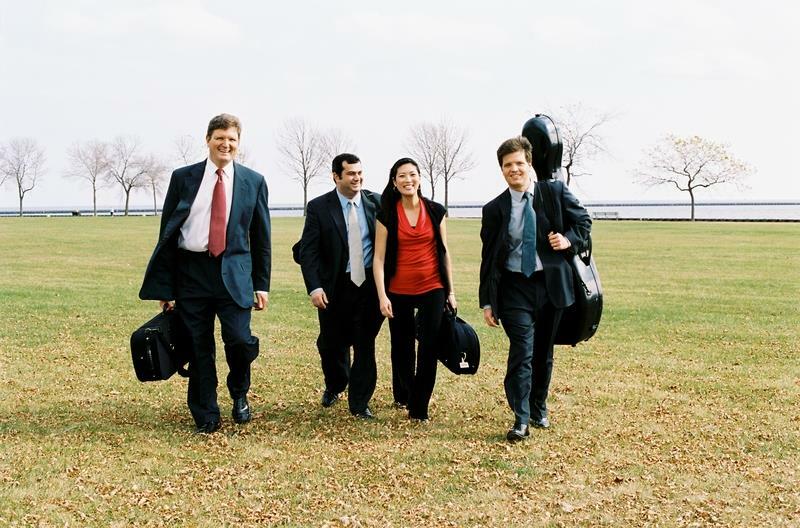 Opening concert of their ninth season offers Haydn, Schubert, Webern. The Philomusica Quartet, will open their season next Monday evening with a concert featuring major quartets by Haydn and Schubert. The Philomusica (violinists Jeanyi Kim and Alexander Mandl, violist Nathan Hackett and cellist Adrien Zitoun) members enter their ninth year as a quartet and their second season as quartet in-residence at Wisconsin Lutheran College. The two quartets to be performed each feature strong, dramatic themes built around songs each composer had written. But Mandl suggests many more parallels which create an integrated concert experience. These Viennese composers wrote works with similar architectures. The two quartets feature key variation movements, snappy scherzo rhythms, minor to major transitions and dramatic finishes. The deliberate connections from movement to movement create a uniform and satisfying listening experience. An established Joseph Haydn completed his final series of quartets in 1796, including the String Quartet in C major, Op. 76, No. 3 “Emperor.” He incorporated a melody that had been instantly popular – a commissioned anthem, “God Save the Kaiser.” Written for Austria, German nationalists adopted it in their campaign to unify the separate German states. As “Deutschland, Deutschland über Alles” the song recalls to us the horrors of Hitler‘s Reich. But the tune also appears in two Protestant hymns – including “Praise the Lord! Ye heavens adore Him.” Why is the music so effective? Mandl suggests the success of the melody in part is due to its constraint within an single “singable” octave. 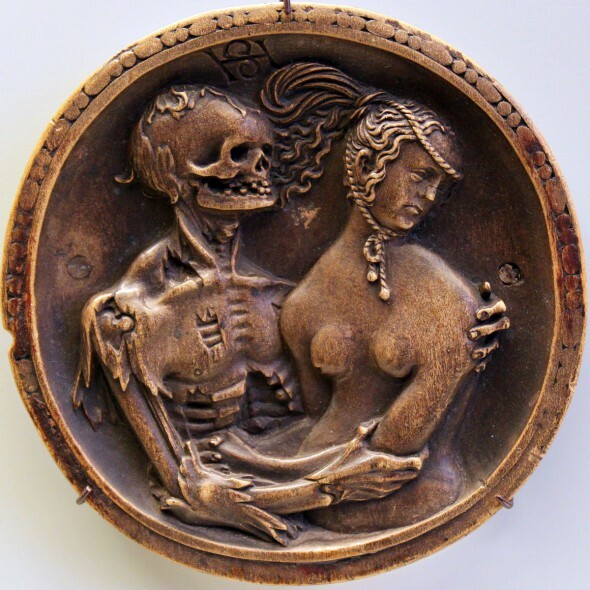 Death and the Maiden by Hans Schwarz [GFDL (http://www.gnu.org/copyleft/fdl.html) or CC BY 3.0 (http://creativecommons.org/licenses/by/3.0)], via Wikimedia Commons. The slow second movement of the quartet offers variations on the song, but Haydn does not tinker with the melody. The quartet passes the melody from one player to another, in an evermore complex accompaniment to the song. This constrained development is echoed within the rest of the work which is harmonically consistent with the central theme. Mandl suggests the poem may be only a part of the inspiration for the quartet. Indeed, the saltarello featured in the last movement quotes a Goethe poem “Erlkönig” that Schubert also set to music. In this story, the devil takes the life of a young infant while a frantic father attempts to flee away. In flight, the quartet gallops at full speed to end the work as an energetic tour de force. In addition, Philomusica will play a tenderly romantic gem by Anton Webern, Langsamer Satz (1905). Langsamer Satz is a carefully symmetrical work, opening with two interlocking themes, rising to a brightly optimistic central section and closing by revisiting the original themes. It was written when Webern, age 22, had fallen for a 16 year old cousin, Wilhelmine Mör. The music leaves little doubt he was deeply in love when he wrote this piece. Mandl is quick to remind us that this work represents the height of Romanticism, before Webern joined Schoenberg in the development of a contemporary, often discordant sound. Patrons who have struggled with parking along Wisconsin Avenue will be pleased to know that a new three-story parking garage has opened just east of Schwann Concert Hall. Parking is free! Philomusica will next play works by Ravel, Boccherini and Dvorak as a part of the Wisconsin Conservatory of Music Festival of Trees on November 14th.